From interior design to money mindset guru. This describes what happened with Tonya Rineer. She shares her story of how when serving her interior design clients she was really more interested in digging into their money mindset and so much more. Tonya grew up in a lower middle-class family. Both of her parents worked a couple of jobs, and always struggled for money. When she was really young, her family inherited a nice amount of money, and she watched the way that her parents and aunts and uncles burned through the money with no idea on how to manage it. Soon they were all back to broke and it had a negative effect in the way they interacted with each other. Her take away was that easy money was bad. Her grandparents were very successful entrepreneurs who were quite well off. She saw the misuse of money in her mother, who had a shopping problem, and after going on a spree, would go to her parents and ask for a bailout. Her takeaway from this was asking for money was bad. You had to work hard for money, and it was going to take a long time. Money was scarce, and that was the only way good money came to people. As an adult, she had to confront her poverty and scarcity mindset. In order to properly manage her money she had to unravel, dissect and reconstruct it in a healthy way. Her strategy to do this was to focus on abundance. She took the time to identify the fears and limiting beliefs she had, and connect to the emotions she had. 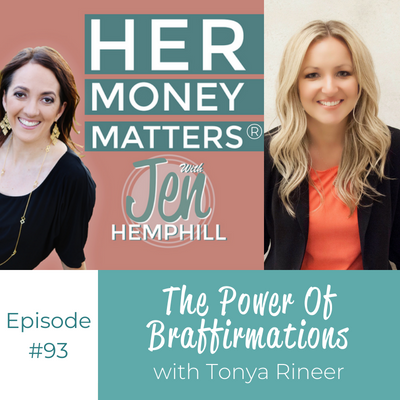 Tonya uses the power of braffirmations, a term she coined which signifies affirmations with support behind them. Instead of using affirmations which feel like lies, such as “I have money in abundance”, she turns it around and will say something like “Money is coming to me more easily than before”, and then supports that statement with something she knows to be true like “because last week I got 2 new clients”. Have a “Murphy Fund” – her term for an emergency fund for all that can go wrong so that decisions are not made from a place of lack. Tonya likes to shop, which she ventures to say is a bit of an addiction. For her, it is not the shopping per se, but the spending and the resulting sense of empowerment she gets from it. She has had to learn to rein herself in, however she does allow herself permission to do that once in awhile without guilt, as she has a shopping fund for this purpose. Every Monday morning she sets aside an hour and a half to download the past week’s expenses for both personal and business and she updates her spending plan. She does envelope budgeting with a software called Money Well. She also uses a paper system which is what she uses to teach her students how to manage their money. They can then go on to a tech tool after they have become comfortable with the system. Tonya’s strongest influencers, were definitely her parents. They were never taught how to manage money themselves, so from them she learned what not to do with money. Growing up she realized she did not want to go down that road herself and so did the exact opposite. In her teachings, Tonya’s approach is to go on a journey with her clients, starting with where they are now, and focus on what is good. She gets to the emotional aspect of money and looks for the positive, and the negative. Negative thoughts are explored in order to identify where the fears are, which are ultimately the blocks. They can then get into the emotions surrounding the fear, and how best to deal with it. Tonya’s first successful business was in interior design. She had the belief at the time that interior designer looked and acted a certain way. She didn’t allow herself to be vulnerable and ask questions. When she realized she wasn’t doing well with her money, she started to work on her mindset via the law of attraction teachings, and money gurus such as Suze Orman and David Ramsey. She also began to get practical with her money, and learned how to think and feel differently about it. In her business she worked with a lot of women entrepreneurs, doing interior design for them. Through befriending them and having conversations, she learned that they felt very similar to how she did – all together on the outside, but not feeling successful on the inside. Coaching naturally evolved from this, and she made the transition from interior designer to Money Mindset Mentor and Success Coach for Women Entrepreneurs. Tonya has a free money mindset training course called The Attraction Formula, a 6-step system that she created by putting everything she had learned into a practical, actionable format.